In spite of the V115 registration and the name Shark, no one can shed any light at present on this 'A' Class boat that turned up at the ME Exhibition. The hull is based on Bob Palmer's 'Patsy' while the motor was built from a set of Octura castings. Initial thoughts as to its origins have not been born out by research so, for the moment, it is another mystery awaiting identification. 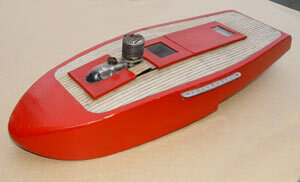 Stuart Robinson was the first British competitor to achieve 100mph with a 5cc boat, and this is it, complete with Super Tigre engine. This remarkable run took place at Tolbuchin in July 1980. So far we have not been able to establish when the magic 100mph mark was broken for the first time at a regatta in this country, or by whom. For a while Stuart held both the 10cc record at 124mph and the 5cc at 100.7mph at the same time. Where has this been for 55 years? The replica International and Hispano Suiza trophies and Milan items give the impression that this is Bobby Grenier's 1956 boat. The complication is that it dates from 12-14 years later. There is a distinct possibility that might not even be Bobby's, as all the French team from the Model Yacht Club Picard used this style of hull and Rossi motor during the 70s and he was not part of that team? The McCoy motor would be contemporary with the trophies. 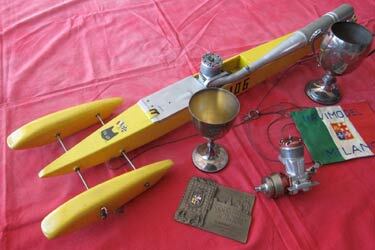 A wonderful example of an early 70s 'C' Class hydroplane with unique pieces of memorabilia. 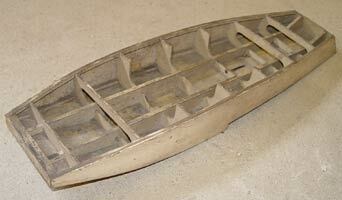 This is the second and smaller boat built by the late Norman Dixon of the Heaton Club. We have already reported on the superb restoration by Tom Clement of Fast Cat and now the smaller version has become available. The perfectly scaled down 15cc version of the EM 30 that Norman built for this hull was described in a Pitbox item in July and it was a pleasure to see this lovely boat, which is in wonderful condition. What a joy it would be to see these two vintage boats running together at a regatta. Not quite what we'd hoped it might be? When this 24" hydro hull first came to light, it was thought that it might be the elusive 1066 Products hull. Having seen it in the flesh, it transpires that it is a Keil Kraft 'Zipper'. 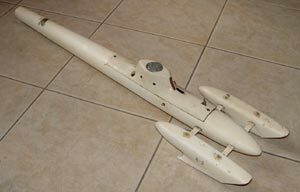 Similar to the Westbury and 1066 designs, (did ETW have a hand in both) the Zipper was sold as a complete kit including flywheel, prop, propshaft and bearings from 1946. It was reckoned to be 'unusually good value for money' at just 32/6 (£1.62). Recommended for engines from 2-10cc this is another commercial rarity. The story behind the engine in this boat was revealed in Pitbox in June. John Scarnell of the Fleetwood Club built a boat and engine for each of the 3 classes normally run, with this being for the 30cc 'A' Class. The 15cc 'B' class boat has been restored by his nephew Dave Scarnell who took it up to Kingsbury recently with the intention of giving it a run. 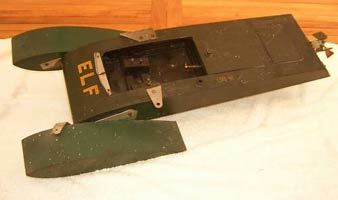 Unfortunately, the 30cc hull was beyond salvage, but the pictures provide a good start in terms of building a replica. Thanks to Dave Scarnell for the photo and details. Aug 2010. Supplied as a kit by the Model Aerodrome Company of Stratford Road Birmingham the 'Drome' hydro cost all of £1-9-6, or £1.50 all bar 2.5p. 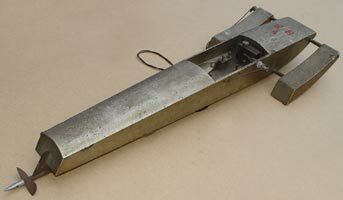 At 2ft long by 8" beam the adverts claim that this hydroplane was 'designed for speed and water driven'. 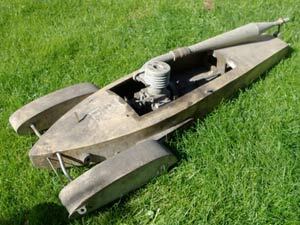 It was also claimed to be suitable for diesel, electric and petrol engines. This example has an original 5cc DC Wildcat dating from the late 1940s.